This visiting teaching message combines two of my favorite things – jars and legumes. Those old mason jars make me swoon. I have a few left to me by grandmas and my great aunt that are some of my greatest treasures. I have them all over my house and my husband is good enough not to make too many snide remarks about our house looking like a cannery. And as for legumes, once the weather gets colder, there is no better comfort food then bean soup and some homemade muffins. For the visiting teaching message, I used a quote from Elder Dallin H. Oaks’ talk “Spirituality” in the October 1985 conference. I love resurrecting little nuggets from old conference talks because most people don’t remember them, and so many of them are priceless. “As faithful members of The Church of Jesus Christ of Latter-day Saints, we have a distinctive way of looking at life. We view our experiences in terms of eternity. 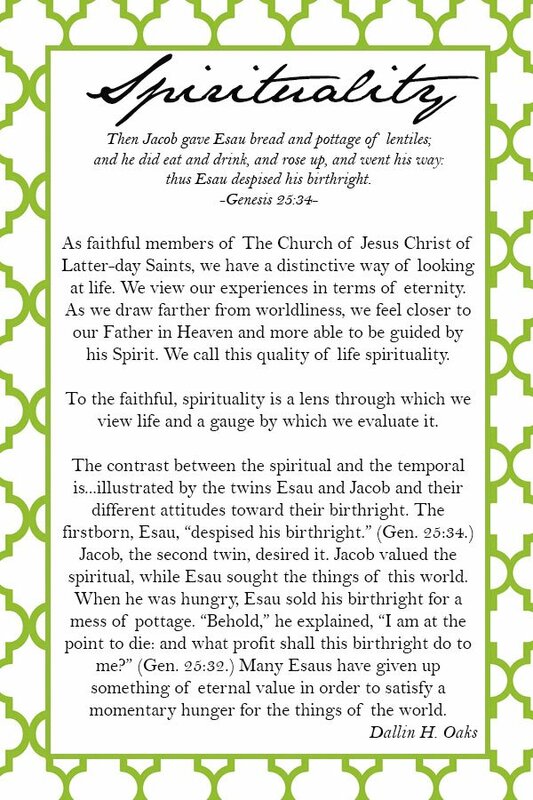 As we draw farther from worldliness, we feel closer to our Father in Heaven and more able to be guided by his Spirit. We call this quality of life spirituality. To the faithful, spirituality is a lens through which we view life and a gauge by which we evaluate it. It is well worth printing out the entire talk to share too. It is so good. So often the “hungers” of this world seem so great and important, but when we focus on the spiritual we become closer to our Heavenly Father and see the true importance of things. I have definitely found this to be true in my life. Things that used to feel like insurmountable temptations, are not even on my radar anymore because they aren’t important to me. I often watch my children fight over such petty things, like who got the most ice cream or who got in the car fastest. It seems so silly to me, but it is so extremely important to them. But I realize that their struggles aren’t that different than my own. In the eternal scheme of things, is the difference between being upset because I didn’t get as much ice cream much different than being upset about not having as nice a car as somebody else? When they get older and have access to more ice cream than they could ever eat, the small difference in serving sizes won’t bother them. But how much happier would they be if right now they could decide not to care and enjoy the portion they have been given. So much of our own unhappiness is engineered by ourselves. 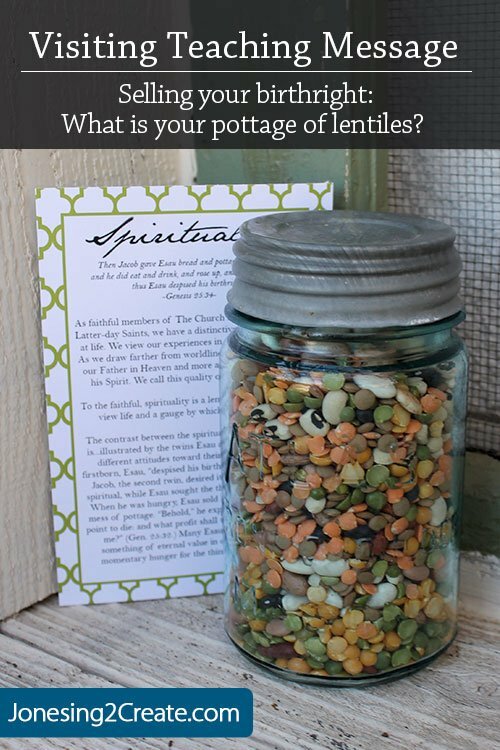 Did you like this Soup Mix LDS Ministering Printable? Find more LDS ministering printables here.